Fluorite is extremely good for balancing, clearing energy blocks, organising thoughts and ideas, and for keeping the aura clear. Therefore, fluorite alleviates chaos, and can be extremely helpful for people learning new subjects, taking exams, or embarking on large projects or creative endeavours – especially projects which involve a great deal of forward planning or which grow as the project unfolds, making it difficult to see or remember the structure within. It acts as “psychic Teflon” for healers and other practitioners (I’ve been calling it this for years, and only recently discovered it is actually used in the making of Teflon), as it allows us to empathise and feel with others without holding on to their problems or illness. It calms and centres, and creates inner expansion, bringing stillness and an ability to work through difficulties without stress. On a physical level, fluorite can be used to strengthen and promote healing in bones and teeth. While cubic fluorite crystals can be gently grounding, the octahedral shape is calming, and brings clarity in times of confusion. In addition to the general properties of fluorite, variations in colour and locality will have further influences. 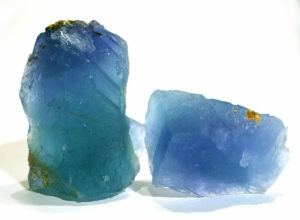 Bingham Blue fluorite is the ‘blue sky’ mineral. When feeling confused, depressed, or overwhelmed, it clears away the clouds and facilitates inner expansion, bringing clarity, lightness, a fresh outlook, and optimism. It can clear the Throat Chakra, whether the issues are physical (including neck problems), emotional or spiritual, as well as supporting the Heart both emotionally and physically. The focus of its energy is around the head, throat and heart, but there is no sense of ungroundedness when using it. That, combined with ‘lightness’, making the physical body feel almost weightless, makes it a superb mineral for ascension and transformational work. 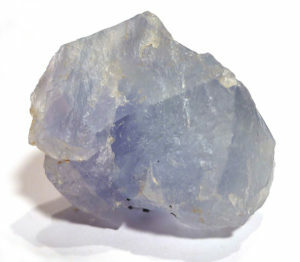 Other blue fluorites will have similar qualities, particularly the sense of inner expansion. Fluorite is a common mineral in hydrothermal veins, often occurring with lead and zinc minerals, and also occurring in pegmatites, granites, and some marbles, in hot spring deposits, and cavities in sedimentary rocks. Fluorite has one of the widest colour ranges of any mineral, and has colourless, white, blue, green, purple, yellow, and (rarely) pink or red varieties. Several colours can occur as zones within one specimen, due to a variety of trace elements that may be present when it is forming, substituting within the structure. It is usually transparent to translucent. Crystals form as cubes or octahedra, and well-formed cubic crystals will also cleave into octahedra. Blue John is a massive variety of fluorite. 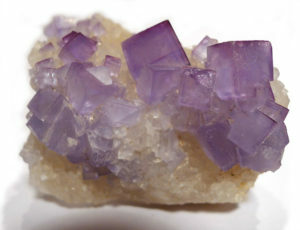 Fluorite has a number of industrial uses, including: as a flux in the manufacture of steel; in the production of hydrofluoric acid; and in the manufacture of opalised glass and high octane fuels. Fluorine is used in the fluoridation of water and in making “non-stick” Teflon coating. Optical fluorite has a low refractive index and low dispersion, which eliminates colour distortion, and so is used for apochromatic lenses in microscopes and telescopes. Fluorite optics are also usable in the far-ultraviolet range, where conventional glasses are too absorbent for use. Fluorite is soft and therefore easy to carve, and its wide colour range makes it a very popular mineral for ornamental pieces. It is also a favourite stone for use in jewellery, in spite of needing extra care to prevent scratching or breaking. Bingham Blue is usually available as small, distinct cubes (around 1-2 cm) scattered over a matrix. It is most commonly pale sky blue, but colour zoning ranges from pale purple to violet in high quality specimens. It originates from the Hansonburg mining district, a series of lead mines worked mainly in the early 20th century. Fluorite was named in 1797 by Carlo Antonio Galeani Napione from the Latin fluere, meaning “flow”, due to the ease of melting when used as a flux in smelting and refining of metals. The phenomenon of fluorescence was first observed in fluorite, giving the phenomenon its name (rather than the other way around). Fluorine also derived its name from fluorite, as it is a major source of the element. Fluorite was first mentioned in print as fluorospar in 1530 in a work by Bermannus, sive de re metallica dialogus (or “a dialogue about the nature of metals”), and in 1556 by Georgius Agricola (Georg Bauer), as a mineral noted for its usefulness as a flux. This was long before it received its modern name. Though known for thousands of years, it was probably confused with other minerals, as there were statues and scarabs carved of it in Ancient Egypt, and it was a favourite material (as Blue John) for drinking vessels during the Roman period (it was believed to make wine taste better, but this may have been due to the pine resin used to stabilise it when carving). The Chinese have been carving fluorite for about 300 years, and powdered fluorite was added to water and drunk to ease symptoms of kidney disease in the 18th century. Bingham Blue was named for the nearest town to the Blanchard and TexMex mines, where it was discovered.